I’m not going to lie: until the Microsoft E3 2017 press conference, I’d nearly forgotten that Ooblets was a thing. I vaguely recalled the game being inspired by Animal Crossing, Pokemon, and Harvest Moon. All titles I appreciate, and two of which I managed to get horribly addicted to. I also remembered it looked cute and seemed like it was trying to add stuff, but lacked a multiplayer option. While at E3 I found myself with a little downtime and the demo suspiciously empty. The line manager assured me that I was allowed to just jump in and play. As it turns out, I was happily rewarded once I did. Upon starting up the demo, I was immediately treated to an Animal Crossing-esque opening after character creation that, is thankfully, less Animal Crossing than I expected. Unlike AC which customizes your character based on how you answer questions, Ooblets’ character creation is visual. This means there’s no worrying about the game giving you that one hairstyle you hate or those eyes that make it appear like you’re an underage stoner. Even better is its character diversity. No, I don’t mean the usual “Yay, people of color!” type thing (which is luckily still in the game). I mean all aspects of diversity: Man, woman, feminine, masculine, young, old, smooth, bearded, etc. I ended up using a balding, middle-aged man with a mustache and glasses. Cheerful life simulators are great, but as an adult, I’m tired of always being a kid. I just did the move to a new place deal in real life. Having done it as a kid both for real and virtually, having the virtual adult option now is something I really appreciated. After the character creation comes our Animal Crossing inspired arrival by train, complete with its welcome by a stranger that’s, well, a bit strange. It’s also when the Pokemon stuff starts to show. Your welcome party of two is one part regular human, one part ooblet, the Pokemon-ish monsters everyone in town seems to have. The dialogue is very Nintendo-esque, with characters referring to control options to help the player, but not always in a straightforward way. For example, one character says something like how dashing with the R trigger is popular with kids these days, but then asks what an R trigger is, which seems confusing. Rather than just choosing a starter ooblet after swearing to help some old guy with his research, players choose a “club” to join. Each club focuses on something different. Adventure and exploration, helping people and being cute, or elitism and competitiveness. That club also awards the player their first ooblet, complete with an equippable fashion item. Your ooblet visually wears this item around town. Similar to the Pokemon games, players aren’t allowed into the wilds until they have an ooblet to protect them. The game uses a police officer to enforce this rule, which reminds me of Earthbound and its cops constantly creating unnecessary road blocks. Even in Pokemon there’s always someone preventing you from wandering into tall-grass so I suppose this is forgivable. Once you have your new pal (mine was walking mushroom called Shrumbo), you can wander around with the little critter, or dress’em up in their equipment (officially called “Bling”). It sort of reminded me of giving clothes to my Crossing residents and seeing them wear them around town. It makes them feel more “mine,” rather than a statistical deviation I just happen to have. 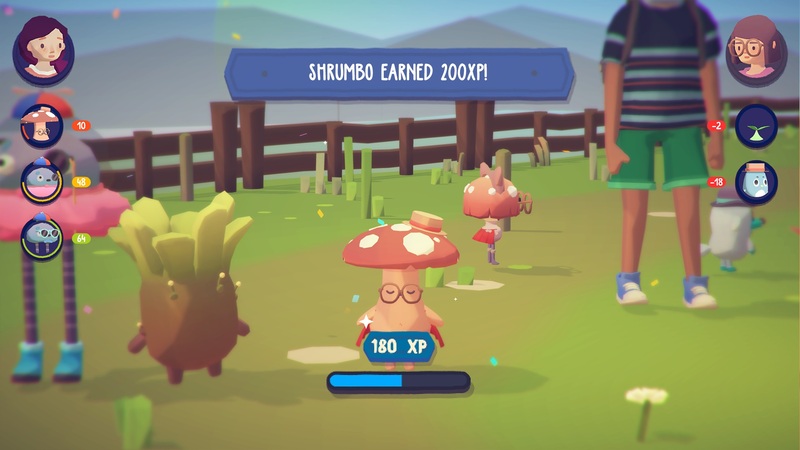 Even better, as you’ve seen in the trailers, you can have multiple ooblets follow you around, something I’m sure many of us have wanted from the Pokemon series ever since we saw Pikachu following Ash. I only got into a few fights, but I saw the opponent at least once, rather than experiencing random battles, which I hate. The UI and animations remind me of Undead Labs’ now dead Moonrise game except, honestly, more fun. Partially because I’m not bumping into any mechanics that require another purchase for me to unlock. The combat is still turn-based. Even so, due to the art style and adorable swagger of the flavor text, it feels more like Adventure Time than Pokemon. The Adventure Time feels chug along nicely. Actually, some of the post character creation options even seem to channel the show, both in terms of a hat that resembles Finn’s to it’s, well, sheer openness. Much like in the recent Animal Crossing games, Ooblets has an acceptance of broader definitions of gender. The game allows both genders to access hairstyles or colors that might traditionally be defined as masculine or feminine. I decided my middle-aged dude should go with pink pigtails, just to see what might happen. The character in charge of further customization is “hair blind,” accepting any style the player chooses. In fact, there’s an early quest to find a lost ooblet, and the owner tells you that “he answers to Princess Sparklebuns” (italics added by me for emphasis). Like Undertale, the game plays with gender in a way that’s funny and safe, approaching the topic with a light touch rather than some heavy-handed preaching from on high. Unfortunately, that’s where my time with Ooblets ended. Something caused the demo to freeze and as I had stood there, laughing out loud and noting similarities to various popular games, a line had built behind me. I’m hoping that means word of mouth will help make sure Ooblets, and its developers, Glumberland get enough attention to continue to thrive.